Hi there kids! This is the event description for the Friday night Battlegound event at Council of 5 Nations. Note that Brook will be running the Saturday/Sunday Campaign/Tournament event so expect to see a write up from him soon. This will be similar to our typical big games, but with a twist. 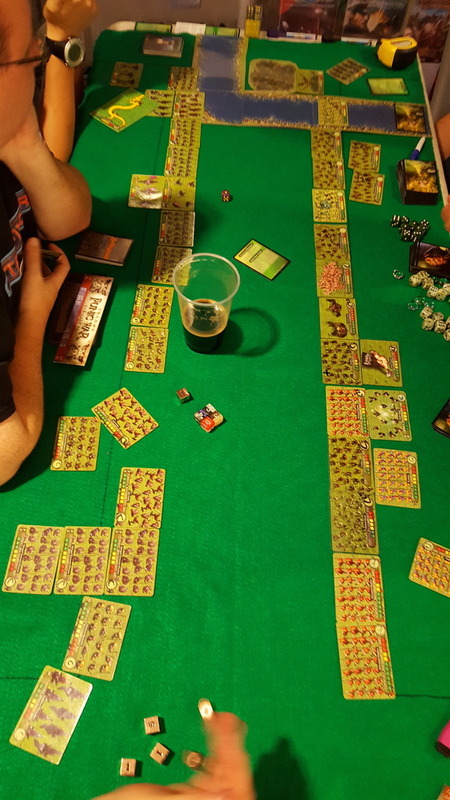 Depending on how many players there are, participants with get to control either a 1500, 2000, or 2250 point army as part of a team against the opposing team. If up to 6 players participate, there will be 1 game. If more than 6 participate, there will be 2 games running at the same time. 1 - Players will secretly write down and submit their faction. 2 - Terrain and Special Condition will be determined and vetoed by individual players BEFORE teams are assigned. Don't worry, I've got a system for this. Factions being played will then be revealed, but teams not yet assigned. See below. 3 - Players will construct their armies in secret. Or as secretly as we social butterflies can get. 4 - Once armies are constructed, teams will be randomly selected. 5 - Beat the tar out of each other. I hope to see you blood thirsty ghouls there! What's the Merc rule for this, btw? Good Catch. You can have up to 20% of the cost of your build be composed of Core Merc units (With Healers counting as Core for these purposes) OR you can have 1 non-core unit. So you can bring a Healer and Wildmen Archers to a 2000 point build, or a Hydra but not a combination of those. OK, here's the quick (and I mean QUICK) run down. We had 6 players, so 3 teams totaling 5250 points each, so 1750 points per player. 3 Core requirements for each but players could use up to 2 Elite units as thought they had 2000 points instead of 1750. Just for fun. It's hard to see from the 1 crappy picture that I got, but there was some mixing of units here. For example, you can see a unit of Dark Elven Coven close to the Wuxing area of the field. Like our opponents, we had some mixing in of units. There where Immortals in the Ravenwood area and that's a unit of Death Knights behind the Treant way to the right side of our line. Notable mention here is that Tim used 2 King's Favors and 1 Levies, netting him ZERO Command Actions per turn. I did rule that he could sound the charge once this game, just for fun. So we had situations where our opponents would forget this and as they where about to roll attack dice vs. a Persian unit and they'd ask "any cards?". At which point Tim would throw up his hands and say stuff like "Why would I wast my precious cards on the likes of YOU?" I'll be honest, this game was so chaotic that I don't remember many of the finer details. I do remember my Death Knights winding up across from a Jade Dragon and them blowing their Fear check, then rolling hot dog and still doing 4 damage on the charge. I also recall one of Tim's Mercenary Hoplities getting totally housed by an inferior opponent. Needless to say, we lost. And turned out well because I started a Battleground demo game with an old friend around 11:15 that took us well past midnight. Participants are free to comment! Looks like Persia acquired such a reputation for invincibility that everyone playing it tested that premise by going full-goofball. Also Tim did that army to have fun. Had nothing to do with the Persia/Skirmishers are op debate. When it comes to battleground Tim is always pushing the boundaries of what a particular army can do. I think the armies he picks are armies that he considers strong to begin with and then attempts to see if he can make them broken with tactics or combos(examples--healer mages on Celestial Guard or crafty use of flying units, etc.) Kudos to him for doing it too. He should be a part of any playtesting group before any faction comes out or is altered. If there is a problem, he'll find it. OK, it looks like a near decade long relationship with photobucket as my image warehouse has come to an end. I took Eric's advice and created a account on imgur. Can you guys see the image now? Yeah, I can see it now. Thanks! My Merc Hoplites should have ordered a Bud Light. They did freaking awful, and they got blitzed by a pathetic cavalry unit. (By blitzed, it took like 8 turns of combat to kill them, so this took forever, and my line got rolled) The 2 Kings Favor Immortals did about average, which is to say they were smoking stuff, but it was going to come down to My Immortal and two of Brook's Bowmasters trying to kill everything. The lack of cards never really bothered me, until I saw the next day some of these cards...holy smokes that have some good ones. I never really needed any orders.